We were lucky enough to snag a couple nights in Manatee Springs State Park. Most every site is 25’ to 35’ RV site and we are just over 37’. Luckily though, there was one Handicap site available that was a pull-through (rejoice) and it was 40’. I called to make sure it was ok that we reserved it, and she assured me it was fine. Sweet! It even had sewer hookups! This spring produces nearly 100 million gallons of fresh, cool water daily. Say what? That’s so cool! (see what I did there) You could watch the spring and see where the water was coming up out of the earth. I bet this park is packed in the summer months. It had such a blue-green color to the water. It was so clear and oh, so beautiful. We only had a couple nights there but we were determined to see some manatees. We rented a canoe so that 3 of us could go out at a time. The girls and I went in the canoe first. There were so many manatees out there. It was a great experience to get so close to them. Just know, you will get fined if you touch them or poke them so, be careful. Keep your hands inside the boat! Apparently you’re supposed to stay 50’ away from them which is near impossible since they swim right up to you and under your boat. We tried to respect them as much as possible, but the whole point of renting the boat is so you can get a closer look. This friendly big guy came right up to our boat and gave us a sniff. Okay, really he just took a breath but still...so fun! Smelly, but cool. Jonathan took the boys out next. One manatee swam right under their boat and nearly tipped them over when he came up for a breath. All the kids loved being so close to the manatee and really getting a chance to see them in the wild. If you don't want to canoe to see the manatees you can just take a walk down the boardwalk and watch them from a distance. You'll also get to see more Cypress knees! If you make it to Manatee Springs State Park, I would suggest you take a dip in the spring. It stays a nice cool 72 degrees year round and it has steps built right into the spring so it’s very easy to access. (Apparently the manatees make their way to the spring early in the morning when no one is around. If you're an earily bird, you can get out there and snorkel with them!) Next time, we plan to go when it's warm and swim with them! Such a neat park. I’m so glad we stopped by. 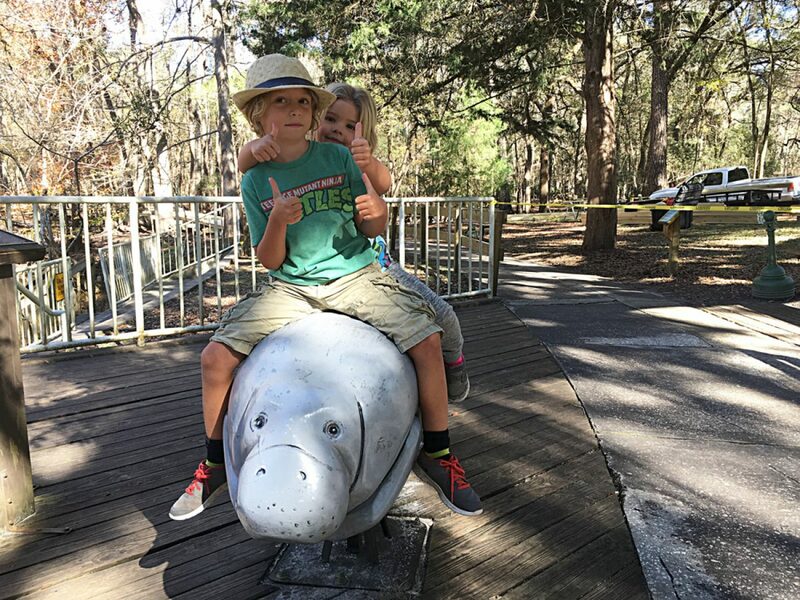 Make sure you visit Manatee Springs State Park before you leave The Real Florida!